Retail copies often come bundled with StarForce 3.0 DRM which is incompatible with Windows Vista or higher. The official multiplayer service is no longer available. Multiplayer's versus mode is capped at 32 frames per second, while co-op is capped at 34.4. A small number of players still roam the multiplayer community on a daily basis. Can be launched without Uplay running in background after downloading. Latest patch 1.05 is here. The Steam version is already patched. Some retail versions of the game have some glitches (ex. the zipline at the Penthouse). A patch can be applied to fix these issues here. Official patch 1.05 is required, the Steam version is already patched. The unofficial map pack adds 41 new maps to the game. MR.MIC's Map Pack is also included, bringing the total map count to 56. Some of the maps included in MR.MIC's Map Pack are from Splinter Cell: Pandora Tomorrow's versus mode. 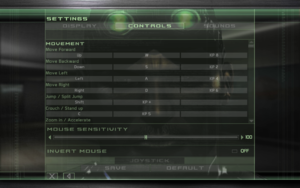 In-game general settings (for Versus Mode). In-game shader settings (Shader Model 2 and 3 only). 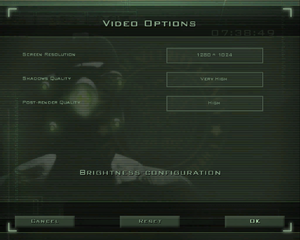 In-game video settings (for Versus Mode). Shader Model 3.0 and antialiasing cannot be used together. To use both, force AA through Nvidia Inspector with this AA compatibility flag: 0x80000000, or use injectSMAA. Multiplayer modes are capped at 32 FPS. Single-player frame rate is capped at 100 FPS. 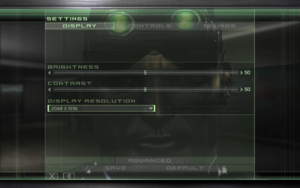 Automatically adjusts resolution and FOV, fixes HUD position and stretching. Works with downsampling or Nvidia DSR - manually change the resolution in the supplied configuration file. You must have run the game at least once before these files appear. Further graphic settings adjustment will revert resolution back to 4:3. 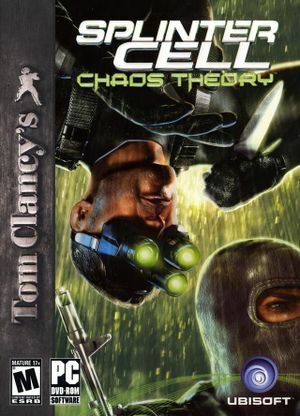 Open %PROGRAMDATA%\Ubisoft\Tom Clancy's Splinter Cell Chaos Theory\Saved Games\Versus\<user-id>_prf.ini. Look for ScreenRes= entry and give it -1 value. Scroll down to the [WinDrv.WindowsClient] class. When changing the resolution values to a resolution different than one of the preset resolutions, Versus will only run using low visual settings. Apply this fix before creating a profile. If your profile was created before the fix, you'll need to zoom in/out with your weapon every time you load a previous made save in order for the custom FOV to be used. In-game key map settings (for Versus Mode). Unable to rebind Mouse Wheel Up and Mouse Wheel Down. 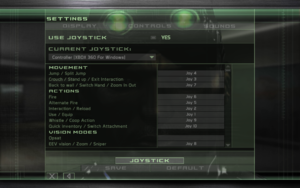 Some menus can not be navigated with a controller. Camera rotation sensitivity cannot be changed (See Keyboard to controller input to map right analog stick to mouse movement). 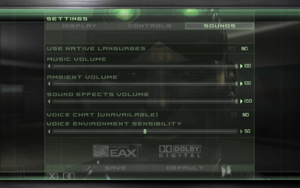 Possible with XInput controllers using SCFix. Mouse acceleration is enabled when aiming with guns. Apply the following fix before creating a profile. Change all biasCut values to v=0.0. Xbox 360/One controllers do not work well by default- in particular, the triggers cannot be used. Use SCFix to add XInput support. Make sure to reset all joystick settings using Settings->Controls->Joystick->Default (even if you have not previously changed them). 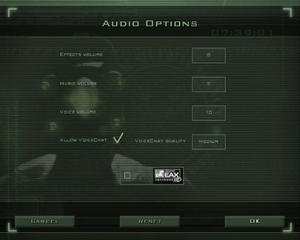 In-game audio settings (for Versus Mode). There are issues using Alt+Tab ↹ in fullscreen mode. If used too many times, it will disconnect players connected to your server and can even crash the game. Netcode only supports a maximum of 30 frames per second for proper sync between players in multiplayer. Bypassing this limit results in things such as co-op actions not executing properly. There is an issue for some users happening at random after a couple of minutes where the game disconnects both players while playing the co-op campaign. 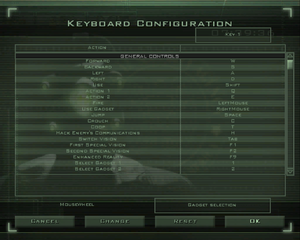 The issue can be encountered 100% during the training mission while hacking the first laptop the players come across. In subsequent missions it seems to happen randomly after some time. No real fixes have been reported that work for everyone. For some completely uninstalling NOD32 solved the problem. 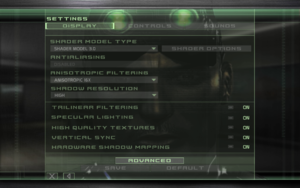 Versus mode has problems rendering certain lighting effects on modern machines. This problem makes it very difficult to play properly. Certain shadows may not render and mercenarie's flashlights don't work, severely impairing gameplay. Follow one of the solutions below to fix these issues. Checkmark all the boxes under Game/Demo Fixes as well as the "Force Max Pixel Shader 1.4" and "Force High Precison Shader" boxes. When you're done, your 3D-Analyze window should look like this. Press the Save batch file! at the bottom of the 3D-Analyze window. Right-click your newly created batch file and click Edit to edit the batch file in Notepad. Save the file. Close Notepad. Double-click the batch file to launch the game. If you want the lights to work properly, you will need to launch the game using this batch file every time. Make a shortcut on your desktop to the batch file for easy access. Download the latest version of dgVoodoo 2 and extract it (verified working on version 2.55.4). Copy all the files from the MS folder and paste the files to <path-to-game>\Versus\System. If everything turns white when you activate your night vision and/or turns black when you activate your thermal vision/EMF, follow one of the instructions below. Enable Windows XP (Service Pack 3) Compatibility Mode. First minimize and then restore the game back by using Alt+Tab. 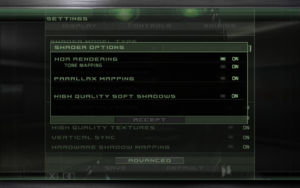 Select another shader model by using the in-game display settings menu. 8, 9 Single Player/Co-op uses Direct3D 9. 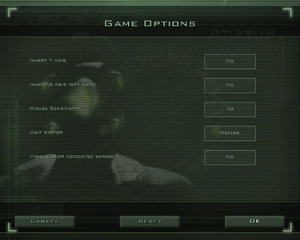 Versus mode uses Direct3D 8. ↑ 2.0 2.1 File/folder structure within this directory reflects the path(s) listed for Windows and/or Steam game data (use Wine regedit to access Windows registry paths). Games with Steam Cloud support may store data in ~/.steam/steam/userdata/<user-id>/13570/ in addition to or instead of this directory. The app ID (13570) may differ in some cases. Treat backslashes as forward slashes. See the glossary page for details. This page was last edited on 18 April 2019, at 07:17.